Being green is where it’s at right now, and Stella McCartney is driving the message home with her Falabella it-bag. It’s a chic piece with a rocker vibe, made of artificial leather and snakeskin. The British designer, who is strict vegetarian, designed this bag specifically to garner respect for the environment. She explains that “fur or animal skins are not required to be creative and successful”. Carried by hand or worn over the shoulder, the Falabella already has owned popularity among fashionistas and celebrities! While some leading ladies all tote around their Falabellas in their everyday lives, few of them like to save theirs for chic soirées and VIP gatherings: proof that the Falabella is both urban and hippy chic. In a wide range of colors or neon mod-pop prints and metallic chain instantly make this bag a trendy item. The Falabella is such an unexpected surprise for women everywhere because it can play a variety of roles. Maybe that’s why the bag itself as well as the core values behind Stella McCartney’s work are so often lauded. The young designer recently reached out to a select few artists to help her launch a new, more unique and artistic Falabella line: David Foox came up with a painted version of the bag that was recently auctioned off to benefit various environmental organizations. Originality and creativity are the key words for Stella McCartney, who’s managed to establish an incontestably successful career for herself. Stella McCartney’s instantly recognizable Falabella bag has become a worldwide signature of hers. The Falabella bag is a Stella McCartney favorite for its edgy design and vegan-friendly construction. Whether you carry it by the top handles or fold it over and tuck it underneath your arm like a clutch—you'll love that the textural element this shimmery artificial leather rendition of the Falabella adds to any look. Signature whip stitching and curb-chain trim. Top handles with 23 cm drop and Stella McCartney logo charm. Slouchy, yet structured body may be folded over and carried like a clutch. Fabric lining; inside, one zip and one cell phone pocket. Stella McCartney Falabella bag is made in Italy. 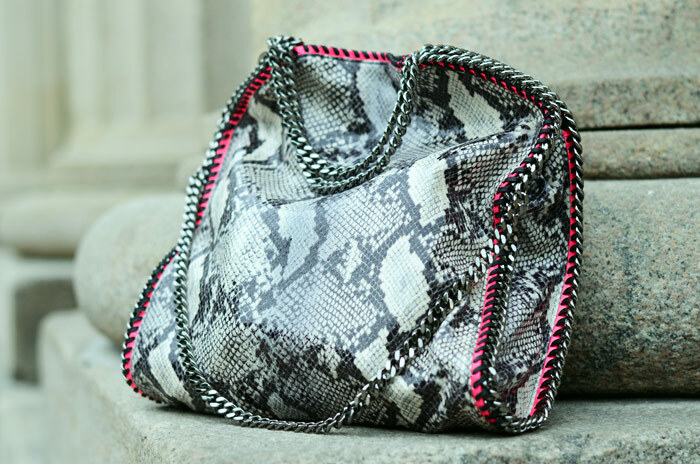 Stella McCartney Falabella bags are made in Italy. Hello Irina, how cool you work at Selfridges! I've been to London last month and of mcourse I've visited the store too! Wanna follow each other? Visit my blog and let me know! Great blog, I'm now following on bloglovin and gfc! I love nothing more than a wander around Selfridges bag departments! LOVE LOVE this post. Great blog! your blog is very inspiring dear! Beautiful bag and name for a bag:) I liked the snake skin one! So great SM Bag..I just love it and your Blog.. I like the black one, simple and chic for any outfit. Your post is a delicacy eaten with flavor. I like the concept, you earn new followers. Would u like to follow each other via GFC and Bloglovin? I love her bag I still need one! Lovely bags!! I love the snake print one, very stylish indeed! This is my current favorite bag on the market! Been having trouble deciding on a color...suggestions beyond basic black? What an extremely informative post. Thank you for sharing! Such a stunning bag, especially because it's vegan! Great post! Thanks for your comment on my blog! Follow each other? If you want, visit my FB page. I love the Falabella bag! Such a gorgeous and versatile bag! I really like your blog! very original! I love Stella for her care and love for animals--I agree that man-made materials can be just as chic as leather and others! Very very enlightening blog you have created--love it! Beautiful bags! I always love anything she designs. beautiful post, that bag is so gorgeous! *drools* I lvoe the snake skin one with the hot pink chain around it. Really like your blog, it's interesting ! Is it Chiara on the last picture ?